You are currently browsing the tag archive for the ‘Champagne’ tag. I will always have a soft spot in my heart for the French 75 because it is what sparked my passion in cocktails. I can’t quite remember where I had my first one—maybe Bouchee or Brasserie Jo—but after one sip I was hooked. Maybe it’s the lightness and delectable drinkability. Or the mild, refreshing flavor of gin and lemon which are given a sparkling lift from champagne. As Kirstin and I enjoyed our French 75s last night, she may have said it best, “It’s like the best lemonade you ever had with a little bubbly added.” I also have fond memories of a variation at The Modern in NYC in which St. Germain replaced the simple syrup. There are bunch of different stories about the origins of the French 75. Was it created at Harry’s New York bar in Paris? Or did American soldiers in the French countryside during World War I “make due” with what they had on hand to make something akin to a Tom Collins? And maybe there are other stories too. 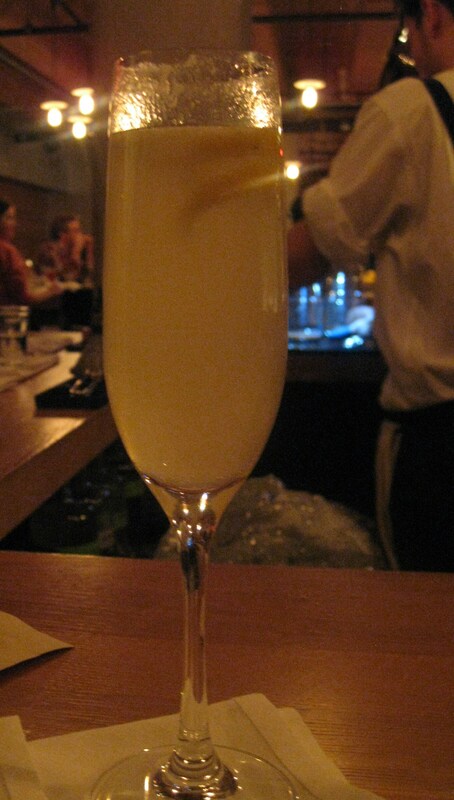 The French 75 is absolutely delicious! Cheers!